For smaller proteins, it is possible to do the backbone assignment using just 15N-labelled protein. 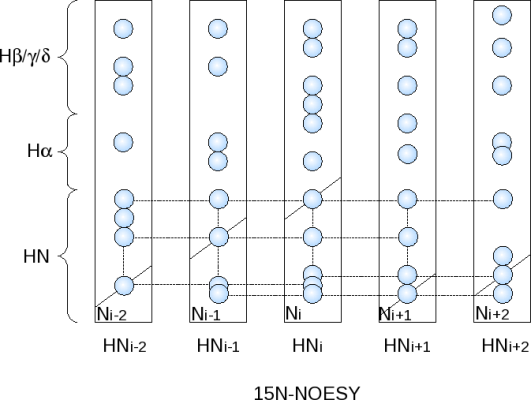 The spectra used for this are the 15N-NOESY-HSQC and the 15N-TOCSY-HSQC. 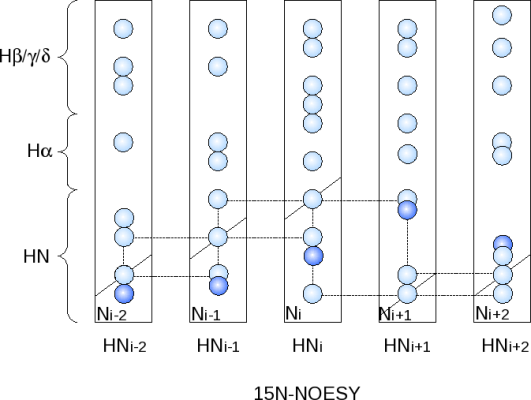 The 15N-NOESY-HSQC will show for each NH group all 1H resonances which are within about 5-7Å of the NH hydrogen. Assignment is done on the assumption that the two neighbouring NH groups are always visible. Thus two NH groups can be linked because they each have an NOE to the other NH group. Note that you always end up with a square motif between strips which are linked by an NOE: each strip has an NOE to the diagonal peak of the other strip. Helical sections are generally easier to assign, as NOEs from NH(i) are visible not only to NH(i±1), but also to NH(i±2) and sometimes NH(i±3). β-sheet structures include short NH-NH distances between the strands. This means that in addition to the NH(i±1) NOEs, a strong cross-strand NOE is also observed. Having a rough idea of the secondary structure and topology of the protein can thus significantly aid backbone assignment using double resonance spectra only. Further help with assignment is provided by the 15N-TOCSY-HSQC. This should show links from the backbone NH group to all side-chain hydrogens of that residue. Using this spectrum the amino acid type can be identified or narrowed down significantly. 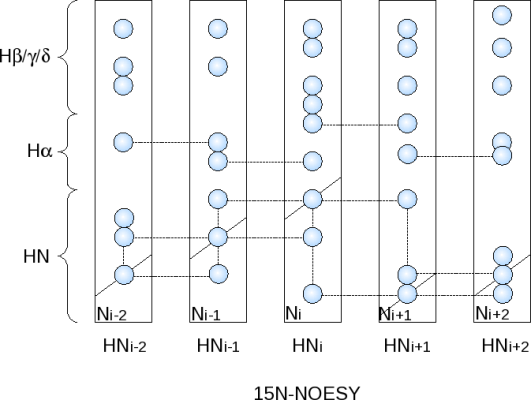 The side-chain NOEs from the 15N-NOESY-HSQC can also be useful during the assignment process, as NH(i)-Hα(i-1) are generally very strong, in particular in β-sheet sections.